The Mainlander Hat is a traditional European style. 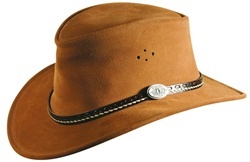 Built from finely buffed Mossback cowhide suede, with a medium pinched crown, narrow brim, welted hatband, ventilation holes and chinstrap facility. Rated with a UPF 50+.